Honey bees are commonly found throughout Florida, growing to about ½” in length and known to have a rounded body, with a more hairy appearance to them then some of their fellow bee species. These bees are most active in the warmer months of the spring and summer, found near the nutrient-rich pollen and nectar found in flowers of different plants common to our area. Honey bees are known to nest in hollow areas of trees, as well as in sheltered areas within walls, sheds, and attic spaces where they are covered from the external environment with perfect surroundings to colonize. Many times, homeowners will notice a handful of bees flying in and out of a soffit vent or opening, signaling an area where a larger colony may have recently made its home. Honey bees are known to be dangerous to humans in that they tend to sting them from time to time. When bees sting, they leave their stinger and poison inside the skin, with only one harmful bite to offer its enemy. They are also able to cause damage to the structure of establishments by building their homes within the voids. The Africanized Honey Bee is a non-native bee to our area that was moved here accidentally in the 1950s, and has since spread to abundance in many parts of the southern United States. They resemble other bees of different names, and find comfortable habitat suitable to healthy populations here in the climate South Florida has to offer. 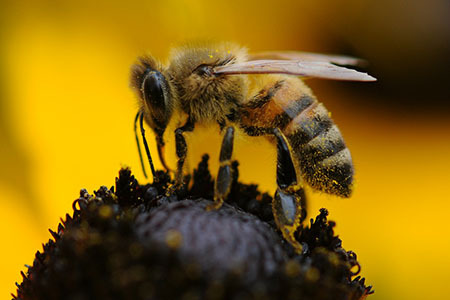 The Africanized Honey Bee is a confrontational species of bee, as they are commonly found to attack in swarms from a considerable distance away from their nests. They swarm in big numbers for long periods, and provide a damaging sting to those who cross paths with them. These bees are aggressive and should not be taken lightly, as we suggest to contact professionals if a swarm of these bees are thought to have been encountered. Don’t hesitate to give us a call if you feel as though you’ve come into contact with bees in your neighborhood or place of work. We will get you headed in the right direction towards a bee-free environment.